Someone recently asked me, "Can you understand the Bible without understanding the culture of the people in the Bible?" My answer was: "Yes, you can understand the Bible without knowing the cultural background. The Bible was written in such a way that anyone can understand its main message. However, an understanding of the biblical backgrounds allows you to understand that message with greater depth." In poetic language, these passage describes a day when God will execute his wrath on the earth. That is the main message. However, an understanding of the ancient practice of treading a winepress brings a fuller understanding of the imagery used here. Our picture of the week comes from Volume 17 of the revised and expanded edition of the Pictorial Library of Bible Lands, which provides "Cultural Images of the Holy Land." Like Volume 16, which we discussed last week, this is a new volume of the PLBL. It covers such cultural images as animals familiar in the biblical world (both domestic and wild), agricultural practices, Jewish cultural practices, Jewish holidays, Christian holidays, the Samaritan Passover ceremony, various types of dwellings, sources of water, shepherding, pottery making, scribes, and more. It is a valuable resource for any Bible teacher or preacher who wants to help people understand the biblical world. You can also see why God is asked "Why is your apparel red, and your garments like his who treads in the winepress?" (Isa. 63:2, ESV). If you look closely at the bottom of their robes you will see that some of the red juice has splattered up onto the people's clothes. You can imagine what this scene would look like if someone was angry while treading out the grapes, stomping and smashing the fruit violently. Even more juice would splatter and would look similar to blood ("their lifeblood spattered on my garments, and stained all my apparel," Isa. 63:3). Such a picture brings a deeper understanding of the biblical reference to Jesus in Revelation 19: "He will tread the winepress of the fury of the wrath of God the Almighty" (Rev. 19:15, ESV). A collection such as this can be a valuable tool in the hand of a Bible teacher. Illuminating the biblical background helps illuminate the Bible itself. This and other photos of "Cultural Images of the Holy Land" are included in Volume 17 of the Pictorial Library of Bible Lands and can be purchased here. Additional information and pictures of cultural images can be found here and here on the BiblePlaces website. Those interested in this topic should also check out the many resources listed on the sister website of BiblePlaces at www.lifeintheholyland.com. I must admit, any time I've considered this practice of treading a winepress to make grape juice, I've always thought it was rather unclean. 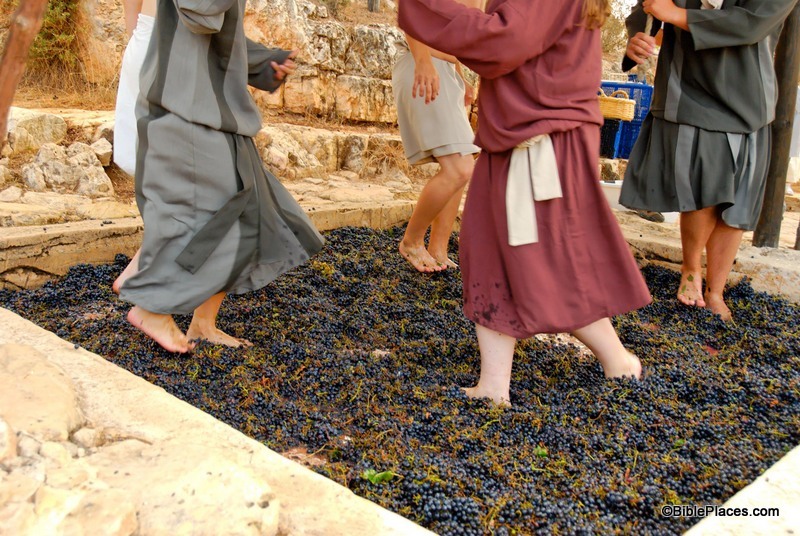 I doubt any of us would want to drink wine that had been produced by people walking on grapes with their bare feet, especially in a culture in which feet got very dirty from lack of indoor plumbing, socks, or paved roads. Even the vat itself doesn't look like the kind of thing any of us would want to drink from. You have a good point, but you must remember that ancient standards of cleanliness were not the same as our moderns standards. I even find myself having different standards based on where I am and what I'm doing. For example, when camping I'm not concerned about things being as clean as they are at home. Just rinsing and wiping off a dish is what we would call "camp clean" in our family, but would rarely meet my standard when we're at home. Just food for thought. According to my research, the natural fermentation of grapes naturally kills germs that may come from the feet.